These selected materials from Africa Atlanta 2014 include: Africa beyond Africa: The Future of Cultural, Social, and Scientific Research (proceedings from the conference held at Georgia Institute of Technology May 15-17, 2014); and Mapping Place: Africa beyond Paper (a catalog) from the exhibition held at the Robert C. Williams Museum of Papermaking, Georgia Institute of Technology, February 26-June 15, 2014. 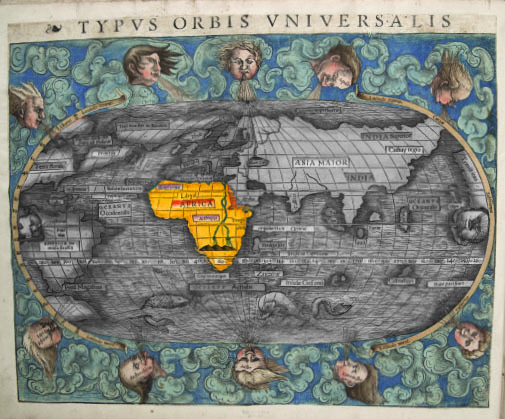 Image: Typus Orbis Universalis from Ptolemy’s Geographia (Sebastian Münster 1540) fol. 2 verso. Courtesy The Newberry Library, Chicago, via Mapping Place exhibition catalog. From October 2013 through December 2014, the Ivan Allen College of Liberal Arts at the Georgia Institute of Technology collaborated with over 50 partners across the City of Atlanta and well beyond to draw attention to Atlanta as a 21st century Trans-Atlantic epicenter for leadership and action. Not only did Africa Atlanta 2014 recognize the historic relationships among Africa, Europe, and the Americas, we also organized projects and provided logistical support for a stellar array of projects by our partners, all designed to showcase our growing strengths in Atlanta across multiple sectors. Focusing on four areas of opportunity (arts and culture, business and innovation, education, and global affairs), our intention was to highlight the amazing resources in our city, as a perfect location for global connections in the Trans-Atlantic region, for building synergies in the future, and for using this collective effort to supreme effect in addressing complex global challenges. This initiative inspired collaboration and encouraged innovation, and it also laid the groundwork for the College to transition our attention to the heart of this exciting enterprise, in recognition of Atlanta as a global nexus. In transitioning to the Global Nexus Initiative, we continue the College’s commitment to innovation at the crossroads of humanities, social sciences, and technology. We take great pride, in fact, in using our expertise in research, education, and public engagement to form holistically shaped visions of possibilities, to create catalytic mechanism for establishing and sustaining relationships amid multiple stakeholders in creating and managing dynamic solutions for complex challenges, and to find robust pathways for local-global engagement. Carrying forward our record of success with Africa Atlanta 2014, our intention is to broaden, enhance, and sustain the excellence of this cutting-edge Trans-Atlantic work. We start the Global Nexus Initiative by recognizing the ground on which we stand, Africa Atlanta 2014, and make two signature publications from this project available. I am most pleased, therefore, that in transitioning the momentum of Africa Atlanta 2014 toward the Global Nexus Initiative, we simultaneously constitute a distinctive foundation from which to launch the Ivan Allen College of Liberal Arts Digital Publications Series.